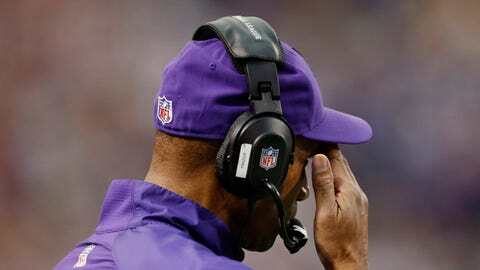 Leslie Frazier was 21-32-1 in three-plus years as head coach of the Vikings. 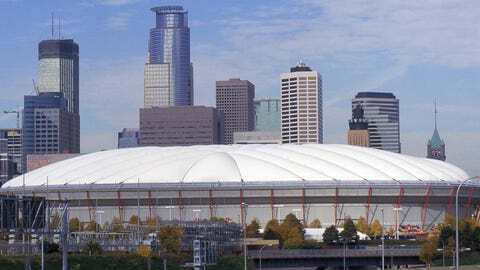 EDEN PRAIRIE, Minn. — To understand the impact Leslie Frazier had on the Minnesota Vikings, one only needs to look at what happened Monday at the team’s facilities after Frazier was fired. Frazier addressed the team in an emotional final meeting with the players before leaving Winter Park, the team’s headquarters. "It was a somber moment," cornerback Chris Cook said. "Everybody was really kind of quiet and really just took it all in. He got a round of applause when he walked out of the room. I feel like everyone is sad to see him go." Frazier was fired after three-plus seasons as Minnesota’s head coach, including a surprising playoff appearance last season. But Frazier was ultimately undone by a 21-32-1 record, overwhelmed by poor play at quarterback and failed chances on Donovan McNabb, Christian Ponder and Josh Freeman in his tenure. Frazier, well-respected by the players and staff, got the chance to say his goodbyes on Monday at Winter Park. Players filed into the locker room shortly afterward to clean out their lockers following a disappointing 5-10-1 season. "It was real emotional," safety Jamarca Sanford said. "He’s a good man. At the end of the day, this is a business, but me and Coach Frazier, you felt it in his voice that he was really hurt and I hate to see a good man like (that hurting). At the end of the day, we’re all people and we all have feelings. "I just hate to see a good man hurt like he was hurting this morning. Coach Frazier, he’s going to have a bright future because he’s a good man. At the end of the day, he’s a man of his word. He’ll be good. That’s my last worry, worrying about how Coach Frazier is going to be in life. I know he’s going to be good." General manager Rick Spielman also addressed the team Monday morning after Frazier was fired. "Just kind of the timeline of the things that are going to come," defensive end Jared Allen said of Spielman’s message. "Kind of explaining and putting people’s mind at ease, answering any questions that anybody had. Just laid out the timeline and explain their process." Frazier had made his impact on the players during his time as head coach, when he succeeded Brad Childress with six games left in the 2010 season, and defensive coordinator, his first job with the Vikings in 2007. Sanford said he had tears during Frazier’s final address to the team. But the calm, steady coach didn’t show the same sadness that was apparent in his voice, according to Sanford. "He didn’t cry," Sanford said. "Coach Frazier, he’s a strong man. He knows he’s going to be good in life. He told us during the year, don’t worry about me. I’m going to be good. Let’s just continue to play each and every week and let’s continue to just try to get better, and that’s what we did each and every week. That’s what we did each and every week. That’s why you never saw the team give up. We never gave up. We left it on the field each and every week, but that has a lot to do with Coach Frazier, the way he coached us and what he believed in and we believe in him." Minnesota started with one win in the first seven games, but rallied to go 4-3-1 in the second half of the season. The Vikings lost a lead in the final minute five times this season, and were plagued by the constant questions at quarterback and a lack of overall depth on the roster once injuries hit. Many of the players had heard the rumors previously that Frazier would be fired, but they were solemn in the locker room after the news became official. "It’s a harsh business," safety Harrison Smith said. "As a player, we all love coach Frazier, as a coach, as a man. You can’t meet a better guy. And also as a player, we didn’t make enough plays on the field. So you just feel like you let him down a little bit. At the same time, it’s part of the business, part of the game now." Frazier’s release hit Cook particularly hard. Frazier stuck by the troubled cornerback despite constant injuries and off-field issues. "Today it was hard to fight back the emotions when he came in and talked to us, and seeing how some of the guys reacted," Cook said, his voice nearly cracking. "He stuck by my side through a lot of things that I’ve been through. Of course, you guys know my story. I told him yesterday after the game and told him I appreciate him for sticking by me and believing in me and my abilities. He’s a great guy and I love him to death." Players said they plan to keep in touch with Frazier, and he told the players to keep his keep his phone number and call if they ever needed anything. "At the end of the day, Coach Frazier, he had our best interest," Sanford said. "As a man, at the end of the day, you respect him. When you talk to him, you respect him as a man and you respect what he believes in. He’s a Godly man. He believes in God. He’s a great guy. At the end of the day, he didn’t succeed like he wanted to as a head coach, but at the end of the day we respect him for each and every play. One player on this team can’t have one bad thing to say about him as a man. As a coach, the way he did things you might have something to say — I don’t. But as a player you might not agree, but at the end of the day you respect him as a man."